Some documents have personal information on the verso that is restricted. Permission to publish, copy or otherwise use these materials must be obtained from the copyright holder. Title NoteTitle based on subject of records. 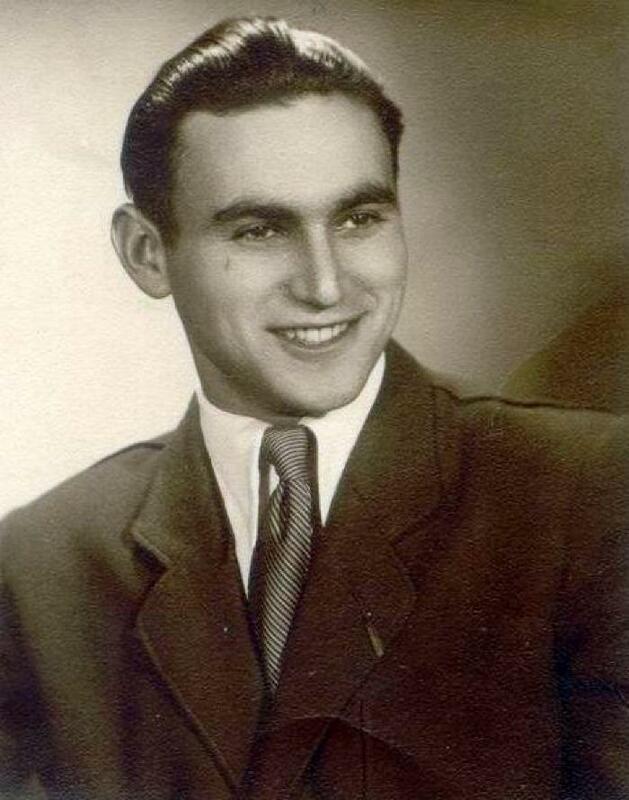 Administrative/Biographical HistoryRudolf Vrba (birth name Walter Rosenberg, b. September 11, 1924, in Topoľčany, Slovakia) was a Slovak Jewish survivor, one of the few prisoners to escape from Auschwitz, and an associate professor of pharmacology at the University of British Columbia, Vancouver. He was born to Elias Rosenberg and Helena Rosenberg (née Gruenfeldová). In March 1939, the newly formed Slovak Republic, a client state of Germany, enacted restrictions and measures against Jews, limiting their employment in military and government positions. In 1941, a new Jewish Code was enacted, forcing Slovak Jews to wear yellow armbands, excluding them from many jobs and limiting their education. Because of these restraints, Vrba could not attend high school and worked as a labourer. In 1942, Vrba set out to join the Czechoslovak government-in-exile army in England but was arrested by Hungarian guards and was sent back to Slovakia. After a short time in a transition concentration camp for Jews, on June 15, 1942, Vrba was deported to the Majdanek concentration camp in Poland. Fifteen days later he was sent to Auschwitz I camp. He was allocated to work in the Aufräumungskommando (order commandos) in Auschwitz II–Birkenau, where he cataloged assets confiscated from prisoners. Vrba worked from August 18, 1942, to June 7, 1943, repacking properties stolen from prisoners to be sent to Germany. For a short time, he was moved to Auschwitz II–Birkenau camp. In June 1943 he was given the job of registrar in the quarantine section at Birkenau sector B II. Working at Birkenau sector B II, he met Alfréd Wetzler, another Slovak Jewish prisoner and together the two men planned to escape from the concentration camp. On April 7, 1944, helped by two other prisoners, Vrba and Wetzler hid inside a pile of wood in the camp, sprinkling the area with tobacco soaked in gasoline to mask their smell from guard dogs. On April 10, Vrba and Wetzler left their hiding place and headed south, crossing the Polish–Slovakian border; they eventually reached the city of Bratislava, where they were hidden by the local Jewish Council. Here they wrote in Slovak the “Vrba–Wetzler report,” a document that described the organization and structure of Auschwitz, which was also translated into German and Hungarian and distributed clandestinely. In April of 1944, after escaping Auschwitz, Walter Rosenberg changed his name to Rudolf Vrba; he kept that name until his death. In September 1944 Vrba joined the Czechoslovak partisans’ fight against the Nazi army; at this time he married his first wife, Gerta. After the war the couple moved to Prague, where Vrba graduated with a degree in medicine. In 1949 he received a degree in chemistry and two years later, a doctorate. Working as researcher at the Czechoslovak Academy of Sciences, Vrba achieved a Kandidat Nauk (the first of two levels of scientific doctoral degrees in former Soviet and Eastern Bloc countries). From 1953 to 1958 he worked at Charles University Medical School in Prague. In 1958, Vrba traveled to Israel for an international conference and defected. He lived in Israel for two years, working at the Weizmann Institute of Science in Rehovot. In 1960, he moved to England, where he worked for two years at the Neuropsychiatric Research Unit in Carshalton, Surrey, and for seven years at the Medical Research Council (UK branch). In the 1960s, following the capture and trial of Adolf Eichmann in Israel, Vrba told his survival story to the British journalist Alan Bestic, who in 1964 co-authored Vrba’s biography I Cannot Forgive (published by Grove Press in New York). In that same year, Vrba testified at the Frankfurt Auschwitz trials in Germany. In 1967 he moved to Canada, becoming a Canadian citizen in 1972. From 1967 to 1973 Vrba worked for the Medical Research Council of Canada. For two years he was a research fellow at Harvard Medical School in Boston, Massachusetts, where he met his second wife, Robin (née Lipson). In 1975, the couple moved to Vancouver, where Vrba worked as associate professor of pharmacology at the University of British Columbia until the early 1990s. Vrba dedicated himself to fighting the neo-Nazi movement in Canada. Rudolf Vrba died March 27, 2006, in Vancouver. John S. Conway (b. December 31, 1929 in London, England) was Professor Emeritus of History at the University of British Columbia in Vancouver, BC, Canada. He completed his BA, MA and PhD degrees in history at St. John's College in Cambridge. In 1955 he moved to Canada, where he taught history and international relations at the University of Manitoba for two years. In 1957 he joined the Department of History at UBC, teaching modern European history and international relations until 1995. In 1957 he married Ann, who he met on the ship to Canada in 1955; the couple had three children: David, Jane and Alison. Conway’s research focused on the role of German churches and the Vatican during the Third Reich, and on Christian-Jewish relations during the twentieth century. In 1968 he wrote The Nazi Persecution of the Churches 1933–1945, first published in Britain, then translated into German, French and Spanish, and reissued in 1997. In the 1970s, Conway was a founding member of the Scholars’ Conference on the German Church and the Holocaust. Conway was the executive Vice-Chairman of the Tibetan Refugee Aid Society of Canada and visited Tibetan exile communities in India multiple times. In 1977, he was awarded the Queen’s Silver Jubilee Medal for his services in the Tibetan Refugee Aid Society of Canada. John Conway visited Israel three times; he lectured at the Yad Vashem Memorial Foundation in Jerusalem in 1993. In 1995 he became Director of the Association of Contemporary Church Historians and edited its monthly newsletter. He was member of the editorial boards of the German journal Kirchliche Zeitgeschichte and The Journal of Holocaust and Genocide Studies. In 1998 he was appointed the Smallman Distinguished Visiting Professor in the Department of History at the University of Western Ontario. Conway was involved in several international associations in Vancouver, including the Vancouver Branch of the Canadian Institute of International Affairs, the United Nations Association and the Anglican Diocese of New Westminster's Refugee Liaison Committee. At the University of British Columbia, he was associated with the Student Christian Movement and the World University Service, as Faculty Advisor. He was a member of St James’ Anglican Church in Vancouver. In the mid-2000s, Conway worked to establish an endowment fund and memorial lecture named after Rudolf Vrba at UBC. John S. Conway died June 23, 2017. The Vancouver Holocaust Centre Society was founded in 1983 by survivors of the Holocaust. The founders’ goal, realized in 1994 was to leave a permanent legacy in the form of the Vancouver Holocaust Education Centre devoted to Holocaust based anti-racism education. The VHEC is an acclaimed teaching museum with a mission to promote human rights, social justice and genocide awareness through education and remembrance of the Holocaust. The VHEC, a leader in Holocaust education, engages 25,000 students and teachers annually. The VHEC produces thematic exhibits, school programs, teaching materials, online exhibits and has a museum collection and archives, survivor testimony project, library and resource centre. The VHEC presents numerous public cultural and commemorative events and publishes a newsletter, Zachor, three times a year. Scope & ContentCollection consists of articles, lectures, correspondence, newspaper clippings and other textual and digital material and produced and collected by John Conway relating to the life, activity and legacy of Dr. Rudolf Vrba, a Slovak Jewish Holocaust survivor escaped from Auschwitz and associate professor of pharmacology at the University of British Columbia in Vancouver, BC. Collection includes audiovisual records related to Vrba from the VHEC’s institutional holdings. Immediate Source of Acquisition or TransferRecords were donated to the VHEC by John S. Conway in 2014. Two audiovisual records were transferred from the VHEC's institutional records in 2019. NoteRecords in this collection have not been digitized. System of ArrangementCollection has been arranged into five series which follow the original order made by John Conway, who donated records in five labelled bundles. RightsMaterials available for research and education purposes only. Permission to publish, copy or otherwise use these materials must be obtained from the copyright holder. Archivist's NotePrepared by Lorenzo Camerini in July 2018. Updated by Shyla Seller in August 2018 and April 2019.